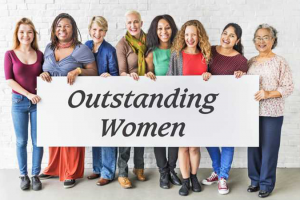 The Stanislaus County Commission for Women is currently accepting nominations for the 2018 Outstanding Women Awards. Nominations are sought for the following categories: Women of History, Living Pioneers and Young Women (high school seniors to age 24 which includes a cash scholarship). Community members are encouraged to consider nominating women who have made a meaningful contribution to the quality of life for all women and children. Nominate a trailblazer who began an important program or took on a challenging cause, a woman who have been first to achieve a significant accomplishment in her field, a woman who has been an inspirational role model or a woman representative in government who stands up for the issues of women and children. Four Turlock women were part of the 2017 awards ceremony. Anoopjot Bains and Shivani Thakur were honored as Outstanding Young Women, while Mary Burton and Patricia Portwood were recognized in the category of Outstanding Women. Nomination forms are available via email at sccw01@gmail.com or can be downloaded from the web www.StanislausWomen.org or can be obtained at all Stanislaus County Libraries. Nominations must be postmarked or arrive by email no later than Jan. 12, 2018. Awards will be presented on March 10, 2018. A local non-profit organization is looking for volunteers who want to help with taxes this year. The Central Valley Community Resources in Riverbank is organizing the program locally, with Darlene Barber-Martinez as the contact person. Reach her at CVCR at 896-3055, ext. 700. The Volunteer Income Tax Assistance and Tax Counseling for the Elderly programs are looking for volunteers who are interested in sharing their skills, talent and knowledge. Volunteers prepare tax returns with thousands of other Americans giving back to their communities, according to Barber-Martinez. She said they need volunteers to serve as Site Coordinators and Tax Preparers. They also need Greeters/Screeners and Interpreters. Citizen input is essential to the success of local government, as such, citizen groups, called Boards, Commissions and Committees, are formed to assist the City Council in making critical policy decisions that impact the community. These advisory groups research, study and discuss specific issues with both short and long-term implications, forwarding their recommendations to the Council. The City of Modesto currently has vacancies on the Housing Rehabilitation Loan Committee, the Citizens Housing and Community Development Committee and Landmark Preservation. If you do not have access to the internet, please contact the Modesto City Council Office, located at 1010 Tenth Street, Ste. 6200, Modesto, CA 95354 or by calling (209) 571-5169. Applications are reviewed as vacancies occur and are maintained for at least one year. The Downtown Modesto Partnership is continuing their Visioning series with a workshop on Nov. 15. The Partnership’s intention with the workshop is to continue the community conversation begun in May by urban strategist Michele Reeves, who talked about how business and property owners can build upon downtown’s unique, positive characteristics to drive economic growth. The workshop will focus on the physical environment of downtown Modesto by discussing potential improvements to streets and landscaping, parks and plazas, the interface of public and private spaces, and other ideas to build on Modesto’s hub for culture, cuisine and community activity. The workshop will be from 3 p.m. to 5 p.m. Nov. 15 at the Double Tree Hotel at 1150 9th Street. The San Joaquin Regional Transit District is hosting Your Transit Needs Workshop, where the public can give feedback on the changing face of public transportation, like the recent change to electric buses. The San Joaquin Regional Transit District is hoping to hear from the public on what transportation-related issues need to be addressed in the community. The District is searching for feedback and ideas on how to change the face of public transportation at their Your Transit Needs Workshop. The workshop will be from 8 a.m. to 7 p.m. Nov. 13 at the Downtown Transit Center, located at 421 E. Weber Ave., in Stockton. Individuals also can provide their feedback by completing one of the District’s surveys, available online at http://sanjoaquinrtd.com/public-hearings/. As an incentive for getting the public’s input, the District will be giving away Amazon gift cards, bus passes, and other prizes. The District has already made one significant change to their transportation network when they converted the existing Bus Rapid Transit Express Route 44 to 100 percent electric, zero-emissions buses. The change, which was done in August, makes the District the first in the nation to feature all-electric bus service. At the time of the conversion, Route 44 will be extended to serve passengers from the Downtown Transit Center in Central Stockton to as far south as Qantas Lane near Arch-Airport Road. The change will enable people who work or study at locations such as PG&E, Dorfman Pacific, Venture Academy, San Joaquin County Office of Education, and the Economic Development Department Qantas Lane office, to commute rapidly and economically. Electric buses can travel up to 40 miles or 2 hours on a charge. The RTD charging stations take about 10 minutes to completely recharge a bus. The price of each bus is approximately $850,000. RTD received grant funding to cover the cost of the new electric buses. RTD will launch a second all-electric BRT route in January 2018 along the MLK corridor in South Stockton. That route will connect with RTD’s existing three BRT corridors. BRT routes move passengers to desired destinations faster than other types of bus routes. 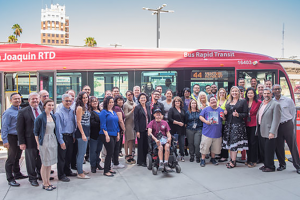 In further support of RTD’s commitment to its clean air initiatives, RTD’s Board of Directors will be asked to pass an official resolution to declare its intent to convert to 100% electric, zero emission buses for all routes serving the City of Stockton by 2025.